The AdNews Agency of the Year Award and Hall of Fame recipient will be selected by AdNews and a consortium of judges. The reinvigorated AdNews Agency of the Year Awards have arrived, boasting an entirely new format, revised entry and judging criteria, a renewed emphasis on celebrating your work – and a brand new chair of judges: Samsung CMO Josh Grace. Our new format is a break with tradition and sets AdNews Agency of the Year Awards apart from the swathes of tired industry awards programs. Instead, we are introducing a three-stage event: a leader’s long lunch, an exhibition of the finalists’ work, and a party to end all parties at a price a cash-strapped upcomer can afford. Taking place on April 5th 2019 at Sydney’s Centennial Hall, Town Hall, AdNews Agency of the Year also features fewer categories. Instead of labouring over more than 30 categories in a marathon ceremony, we have slashed the count to 20 entered and two chosen categories (see below for a complete list of the overhauled awards). We are absolutely thrilled to present our new format – our leader’s long lunch where will give free, VIP invites the leaders of the organisations who appear in the finalists lists. The exclusive lunch will run from 2:30pm and 17 of the awards will be distributed by two new presenters, who may well be familiar to some of you (more on that to come). Our exhibition of the finalists work will be housed in Centennial Hall throughout the lunch and evening party, showcasing the amazing volume of work from 2018. The exhibition will also be transported to a home outside of the event for three months (more information on that to follow). Our intention is to give the work more life outside a one-day event. At 5:30pm, doors will open to the entire industry and we will hand out four very special awards: Emerging Leader of the Year; AdNews Hall of Fame; Employer of the Year and of course, AdNews Agency of the Year. To bring life and celebration to our party we are striking deals with seven special partners to deliver activations at the evening party. Be prepared to have the night of your life. Tickets will be priced at entry-level prices to ensure we can all be part of the celebration. We are also very proud to announce we have overhauled our entry criteria. Every category has been entirely re-written and while we are, on occasion, asking for the submission of more corroborative information, we feel this is necessary to ensure a fair and level playing field. We have also listened to some of your feedback, and we have extended the deadline to February 1 2019, meaning you don’t have to rush back from Christmas to get your entry in. We are also assembling a brand new panel of judges – led by Samsung CMO Josh Grace – who will be selected from client side. No agencies will be selected to judge other agency’s work. AdNews knows that awards programs need reinvention to stay relevant, credible and fun. They need to be a celebration of the work that allows brands to stay ahead of the game. 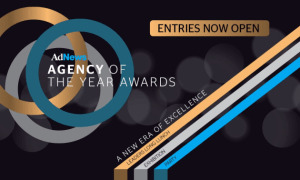 2019 is a year of reinvigoration for the AdNews Agency of the Year Awards where the work is celebrated, and everyone working in the industry will have a chance at being part of that celebration.